In june Gilles & Cecilie were invited to talk at the Pecha Kucha event in Oslo. They decided to share their experience running personal project The Travelling Drawing Club. Below is the 20 slides that are up for only 20 seconds and change automatically as you speak. I’m Cecilie, an illustrator and designer in Gilles & Cecilie Studio since we started it 10 years ago. 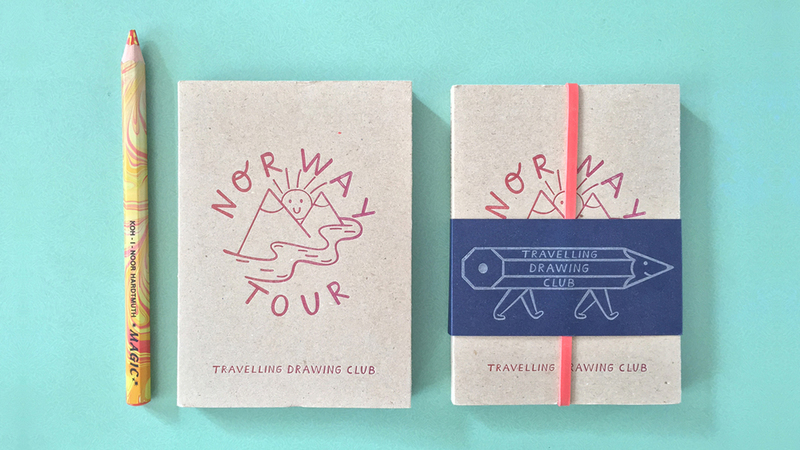 Together we founded the Travelling Drawing Club in 2011. Drawing is essential part of many professions as animator, architect, designer, communicator, fashion designers, theater and film. It is an important skill for even more areas as developing ideas, documentation, research, planning for engineering, maths, medicine and sport. Many valid reasons why drawing should be an integrated part in education. Art should be a part of life to help us understand and to explore science, technology, engineering, maths and innovation and the holistic connection in between it all! We love drawing and wanted to dedicate 2 hours just for the pleasure of drawing something, to be with friends. to discuss and to observe while travelling with work. A great way to also meet new people on our journeys was to start a drawing club. Sketchbook from Barcelona. At first we told friends by email and announcing on Facebook. After a while we started to share our events on Instagram, Twitter and word of mouth. 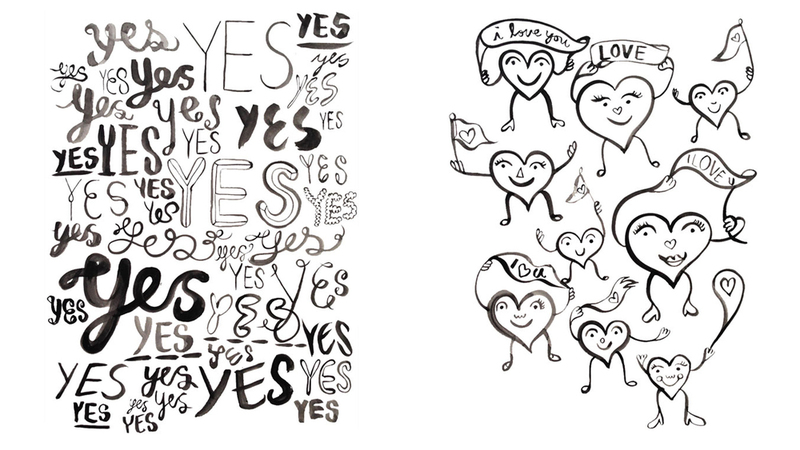 Sketches from making flyers for each Drawing Club. As any organisation or event develops we thought it was important to create a visual identity. We wanted a logo, something recogniseable, friendly, inviting and including that could attract a wide audience. We landed on the happy walking pencil. Early sketch for the logo. Drawing enthusiasm and joy when we got to know that The Travelling Drawing Club received a grant from Grafill. In 2014 we applied for grant to develop the concept and got awarded grant from Grafill. This was a huge milestone for our project. A confirmation and believe that our idea potentially can grow and become something bigger than for just us and our friends. The Travelling Drawing Club No: 10 at the Tate Modern. Drawing in the Turbine Hall. Drawing is a social activity. It’s a language that can make people understand eachother regardless what language we speak. At Tate Modern we had 2 people visiting that had seen the ad on Instagram, they were visiting London and loved the idea of meeting locals and spend time drawing together at the Tate. At the Gol de Letra Foundation in Sao Paulo they use music, sport, art and design as an active part of learning. We got invited to run a drawing club and fanzine workshop with their youth between 7 and 14. The children could choose their own favourite theme to write about and to illustrate. We keep sheets for people to register when they participate on a drawing club. We think it is important to document the project. Drawing is a primary method of expression important in general education as well as a profession or as recreation. Our Norway tour started at Hydrogenfabrikken in Fredrikstad. Netron digital agency helped organise it and Presserommet made wonderful little notebooks for the participants. A wonderful collaboration. Details from work in progress making flyers. We have a love for botanic and nature and use organic forms as inspiration for many of our projects. Every new place we visit, we always find the botanic garden. 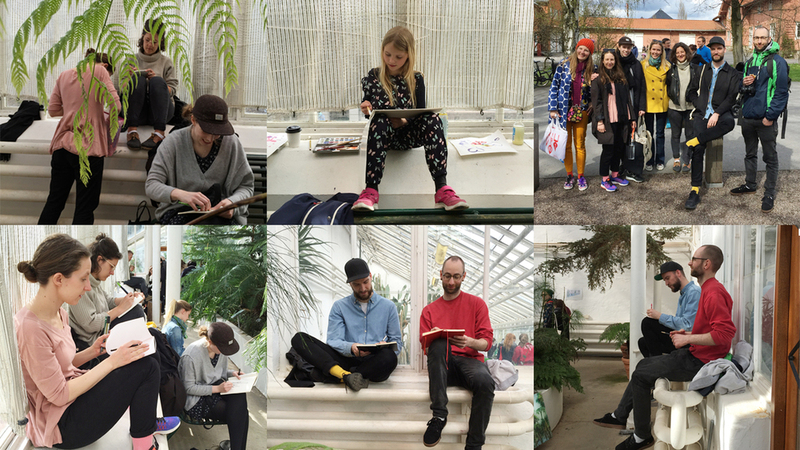 In Oslo we have visited the Botanic Garden many times to draw together with fellow illustrators and artists Jon Arne Berg, Jonas Bødtker, Jon Benjamin Lund, Fadlabi, Karin Erixon, Ingrid Rognstad and more. Flyer for The Travelling Drawing Club in Tokyo! Last year we even had a drawing club in Tokyo with old high school friends and colleges from Central Saint Martins. Through social media everything is possible. 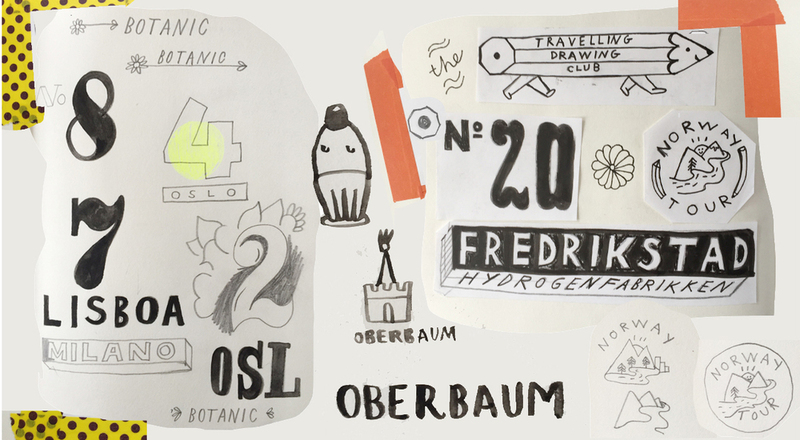 Proud to be part of the Visuelt program in Oslo with an early bird edition of the Drawing Club at the house of Dance. At the Visuelt Festival we asked participants to bring an object so we could create a composed Still Life to draw. A great way to start the day with coffee, pastry, drawing and meeting illustrators and designers. Fanzines Riso Printed at Hato Press as give aways for first arrivers. Drawing helps visualise ideas, to document experiences, to analyse the world around us. It helps us to remember how things look like and to draw a map to share a direction to someone. 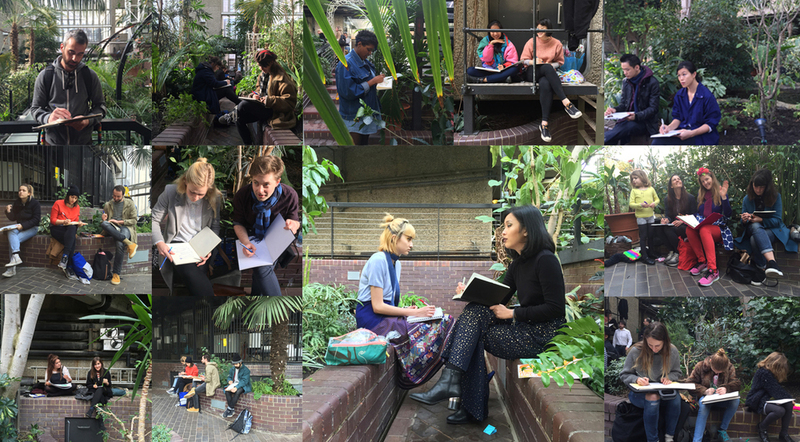 Drawing Club at the Barbican Conservatory in London. Through social media this event spread fast as fire. More than 60 people turned up. Fantastic to see people behind every plant in Barbican Conservatory drawing. At the Somerset House during the Pick Me Up Festival. We have been to 16 different places, running 33 drawing clubs with more than 250 participants including illustrators and designers also artists, children, lawyers and teachers. Announcement for drawing in Oslo after the Pecha Kucha talk.